Over many years now, we’ve catered lots of different types of parties and events, including corporate hospitality functions. Whether yours is a local business with just a few employees or a national company with hundreds or more, we can provide outstanding catering, with superior ingredients and the personal touch from our professional and courteous staff. We’re not only known locally but nationally, too, and our word of mouth recommendations are certainly something to be proud of. 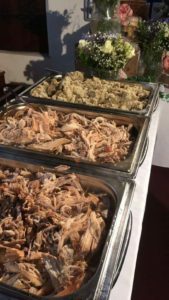 When Joe contacted us recently, he had been recommended to us by a colleague and was looking for a quote for a hog roast Croydon business dinner at his small local company, for both employees and key customers. We’re a popular choice for corporate events and a business dinner is no exception, as our signature centrepiece hog roast Croydon makes it a truly memorable occasion and one that is always in demand these days. With tasty food and great service, hog roast Croydon can turn an everyday party into one that will make your business stand out from the rest. For Joe’s business dinner, he wanted a menu of pigs in buns and some side salads, including leaves, coleslaw and potato salad. There were around 50 guests expected, including one vegan and one vegetarian, and stuffed mushrooms would be an ideal option for both. Happy with our food choices and our affordable price, Joe booked us in and we catered the work party yesterday. Our team arrived early in the afternoon to put up up the gazebo and prepare the medium-sized hog. Service for this business dinner would be from about 6PM and this particular beast would take 5 hours or so to cook through and through. Joe watched eagerly as I scored, wet and salted the meat before turning the hog roast machine on, as he has been thinking of hiring one of our machines for a DIY roast of his own in the future. The employees and clients mingled as the hog rested and gave us wonderful aromas all over the work gardens and it was finally time to get the carving knives out. Feeding this informal, relaxed group of guests was a real pleasure and Joe’s already booked us in for a future event at work and he’ll be hiring a machine from us himself soon, too.